Many people often dream of packing their bags, getting rid of their unnecessary belongings and living in a foreign country as an expat. For millions of people, it would be a dream come true to be able to immerse yourself in a foreign culture, learn the language, eat the local food, and gain a better understanding of the locals while developing and cultivating friendships and relationships that can last for life. Unfortunately, life always has a way of putting those plans on hold. For many people, the responsibilities and financial obligations of daily life sometimes make that dream of the expat and travel life nothing more than a pipe dream, especially when a person or family gets the idea that moving overseas and becoming an expat literally means leaving everything they have ever known behind and sometimes starting over from scratch. It certainly does not have to be like that though. 30 years ago, it was certainly more difficult to become an expat since the pace of life moved much slower, and information was harder to come by. However, with the rise of globalization and the Internet, the world has become way more connected than anyone could have ever thought possible. As a result, a proliferation of information is now available that makes it quite easy for a person to start taking the first steps into experiencing an expat life or becoming a world traveler. Of course, I understand and respect that not everyone can just "up and leave" since everyone has a different life situation. Yet, if a person wants to experience the expat life for at least a little bit, there are still plenty of opportunities to do that without needing to totally uproot your current life and leave everything behind (that can come later if you feel that life fits you better). Here are 8 relatively easy ways to become an expat that could possibly lead to a long-term life overseas or a memory of a lifetime at the very least. Many companies have locations in different countries (Allianz, Ernst & Young, Shell, Pearson, Macmillan, Samsung, Google, Facebook, Citigroup, Taschen...the list goes on), and if there is a need, it is possible to put in a request for a transfer. For example, I once was on a tour with a couple in Morocco who were from Texas and worked in the oil industry. They put in a request to be transferred to Algeria, and it was granted. Typically, the transfer might be only for six months to a year, but it is a chance to live as an expat and experience a new country and culture. In addition, your company will most certainly help you with the move in some way with a moving stipend or assistance with housing. However, be aware that there might be a language requirement for the country, so it is always good to ask. Technically speaking, studying overseas as a student for a semester or year is not quite what an expat is, but it can certainly be a good lead-in for what an expat life can entail. This is also one of the easiest ways to move to another country for a certain amount of time. Many American universities regularly send thousands of US students to colleges and universities all over the world to live and study. Often the length of time is for a summer, a semester or a full academic year, but that gives a student a taste of living overseas in a different country and learning a foreign language. In addition, this is probably one of the safest options since there is more of a safety net in case something goes wrong. Study abroad can also be the seed that might lead a person to decide to pursue an area of study which will allow them to live an overseas life as an expat in the future. If you are service-oriented, there are many volunteer opportunities that are located overseas that cater to people who would like to spend a vacation period helping others. If you have a couple weeks free or more, it is entirely possible to move to another country for a specified period of time and do volunteer work that can range from teaching, building projects, or infrastructural projects in relatively poor areas. This is an excellent opportunity to experience a new culture, meet other like-minded people who are interested in helping their fellow human beings, and do a positive service in a country or area where basic services may be lacking or non-existent. Ultimately, volunteering can be an all-around positive experience, and it is a great introduction to expat life with the possibility to extension. 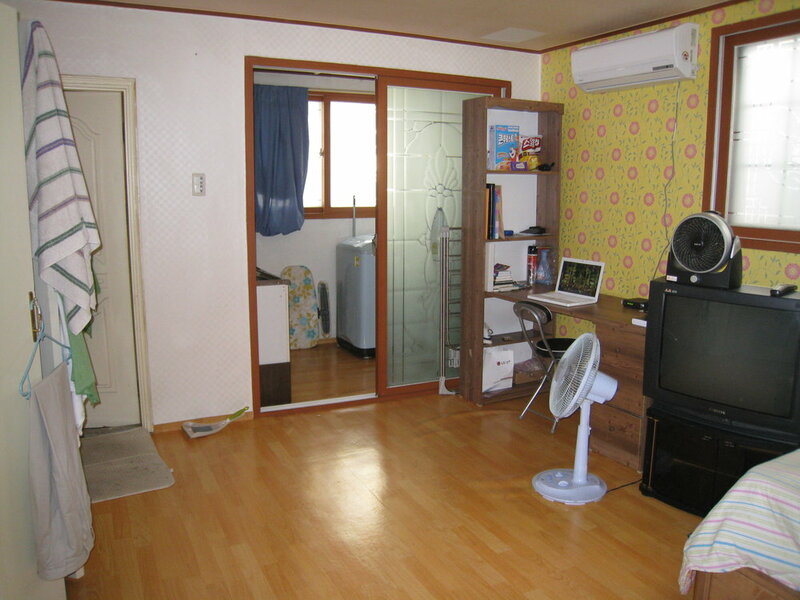 My apartment when I taught in South Korea...I did not do the decorating. English is currently one of the most in-demand languages throughout the world. People all over the world want to learn English for a whole host of purposes, and they almost always prefer native English speakers rather than locals who have learned English. As a result of this huge demand, there are literally thousands of job opportunities for teaching English overseas in a whole variety of countries, and this is one of the most popular ways of becoming an expat in a relatively easy manner (each country differs on requirements). However, caution must be exercised when searching for ESL jobs since it can be very easy to be taken advantage of if you don't ask the right questions, and it is absolutely necessary to do research before pursuing this avenue. A later blog post about this will appear later. I can't speak for every expat, but pretty much all the expats I know, I met via teaching English overseas. For people who are religiously-minded and want to spread their faith to people across the oceans, it is possible to become a missionary and be sent to a far off place for a specified period of time. Many different faith denominations often send their members to minister to the local population or start faith communities in the places they are sent to. For instance, I personally saw US Mormon missionaries in their classic black tie and white shirt with the nametag, "Elder...." in Chisinau, Moldova trying to win converts. Serving as a missionary is a chance for a person to learn a foreign language and interact with locals in a close manner while sharing their closely-held beliefs. This one is geared more for females since it is quite unusual for men to serve in this function, but it is entirely possible for girls, particularly recent high school graduates or college graduates to take a short term gig au pairing for a family and helping take care of their children. There will of course be family responsibilities that an au pair will need to deal with, but many au pairs are given time off. They can often use that time to travel a bit and see a different part of the world. In addition, many au pairs actually stay at the family's home and become something of a member of the family, so it is an excellent way to integrate into a local culture by means of a local family. Plus, when the family goes on holiday, the au pair will usually accompany them with no cost to the au pair. This does not quite fit the idea of an expat, but it allows a person to see the world and visit many different places while still making some money. If anything, you would be something of a "wandering expat." A cruise ship has a huge variety of jobs for people who have different backgrounds, and most of the jobs will deal with something relating to hospitality, so it will definitely help if you have had jobs of a similar background. In addition, if you have other skills, such as singing, dancing, or playing a musical instrument, it is certainly possible to get a job on a cruise ship. Another benefit of working on a cruise ship is the fact you will be able to probably have time off when the ship is in port, and you will meet people from literally all over the world. Depending on what country you are from, it is possible to become an expat by serving in the armed forces. If you serve in the US Army, it is possible to be sent to a base located in a different country, such as Germany, Italy, South Korea, Japan, Afghanistan, Iraq, or several others. If you serve in the army, you will most likely live on the base, and for those with families or married couples, it is possible to have a residence or quarters to yourself which will afford a certain degree of privacy. These are certainly not the only ways to experience the expat life. There are many other ways, and those can be discussed in a later blog post, but for those people who might have a desire to have a taste of expat life but are not ready or able to make the full move, these opportunities can give a taste of living and working in a country in a different way away from the typical vacation track. Even if you ultimately decide to not completely "up and leave permanently," it is certainly possible to get a taste of the expat life for a relatively temporary period. Have you ever done any these? What did you think? I'd love to hear your thoughts.